I'm sure you heard about Angular 2 and that it will be totally different. Forget everything you know and start from scratch. Jokes aside, if you have taken a closer look you already know that, yes, it will be new, things will be different (as it's mostly the case with new stuff), but many concepts will still be there. Well, as Angular 2 starts getting more and more concrete, articles, videos and podcasts get published that contains lots of useful information on how to get prepared an eventual migration scenario. I use this article to collect such best practices for myself and and obviously to share them with you! Totally feel free to submit new practices in the comments, or directly submit a PR in the github repo for my blog. Definitely switch over to the controller-as syntax and get rid of $scope in your controller files as well as in the templates. First of all, Angular 2 won't have any concept of $scope and then - especially in the HTML - using the controller-as syntax avoids a lot of headache when it comes to nested controllers. When should we use which?? That's a common question among Angular devs. You can find some suggestions on the Angular docs and in various online communities, but it's not always that clear. Angular 2 removes all of these, you'll have a component (directive) and a controller class associated to it. As an obvious result, people suggest to use "directive controllers" wherever possible. However, when controller is enough, use that. You don't have to deal with rather complicated compile/link things. There's a nice article on Thoughtram about that. Follow the link below. 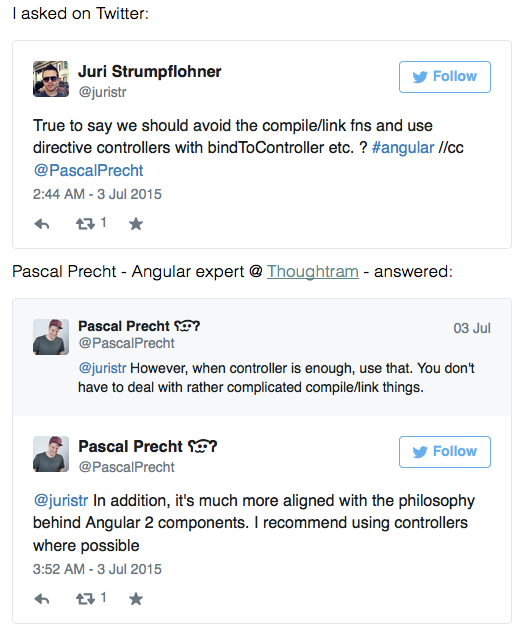 Angular 2 follows the current trend of web components. Thus, it won't have autonomous controllers any more, but just in conjunction with so-called components. An Angular 2 app is a tree of nested components, with a top-level component being the app. Note that PersonController passes in the data required by our list component. Thus it remains fairly re-usable. All it does is creating the UI functionality. David East recently spoke at Angular U on how to prepare for upgrading to NG 2. What's particularly interesting is his usage of Rx.js to avoid $watch.